In Rwanda, coffee production is one of the fastest growing sectors and fuels the country’s economic development. 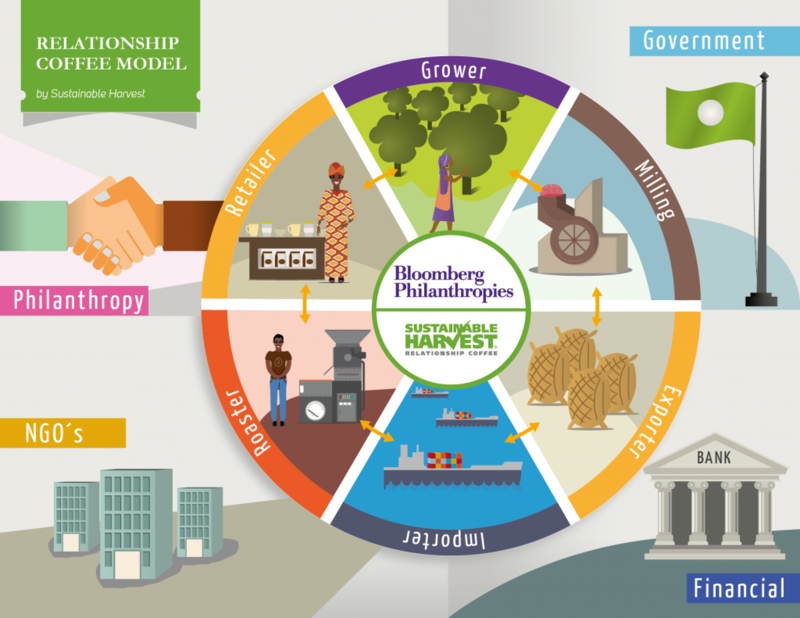 Bloomberg Philanthropies partnered with Sustainable Harvest Coffee Importers in 2013 to create the Relationship Coffee Institute, which works with women farmers to cultivate sustainable agriculture techniques that improve the quality and increase the production of coffee. Through hands-on training, RCI teaches women how to produce specialty-grade coffee. They introduce women to roasters from around the world and help them learn from other farmers across the globe through their Let’s Talk Coffee platform. In order to expand the domestic market for specialty coffee grown by Rwandan women, the Relationship Coffee Institute created a new coffee brand, Question Coffee, and opened a retail café and a wholesale business. In one year, Question Coffee has sold to 19 wholesale customers, including the Kigali Marriott, the first hotel in the global Marriott chain to source coffee locally. Across Rwanda, Question Coffee’s women-grown specialty coffee can be found at leading cafés, restaurants and hotels, including the Marriott, Radisson and Serena. Question Coffee is also partnering with RwandAir to serve Rwandan specialty coffee on all RwandAir flights, with over two million cups to be offered in the next two years. These partnerships enable domestic and international consumers to support smallholder women farmers and their families in Rwanda.